The first time I ever came across sliders in a restaurant I thought to myself, “What kind of witchcraft is this! They shrunk the burgers!” However, I quickly came to realize the genius of the plan… now I could eat MORE burgers! 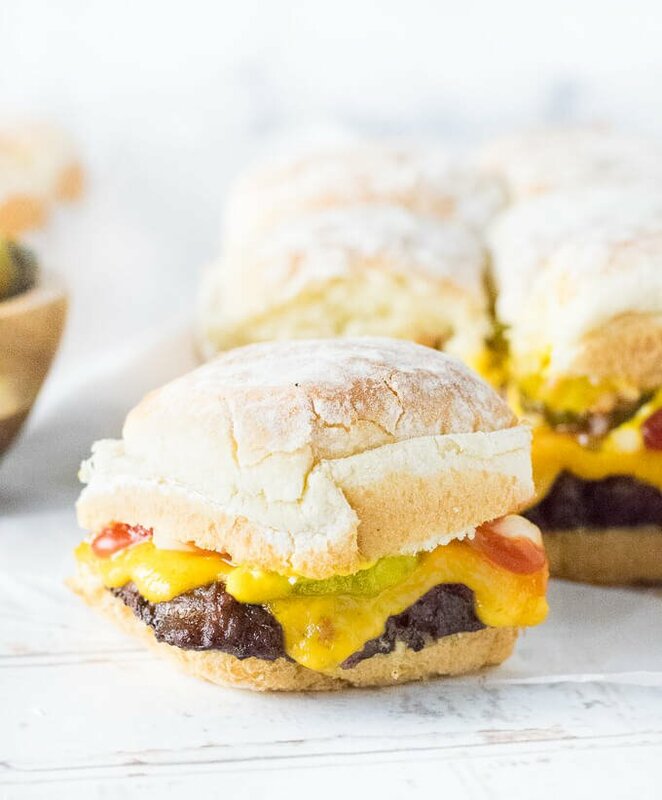 Homemade sliders make a fun family meal and are easier to prepare than traditional burgers. Not to mention, there is a lot less cleanup because these are baked in the oven. Their compact size makes them ideal for your next party menu as well! They are a guaranteed crowd pleaser. Traditionally, when you order sliders in a restaurant they each are served with their own mini burger patty, similar to a meatball. In all respects, they are just a miniature version of a traditional burger. However, for this homemade version, we make it easier by baking one large patty and place it on attached dinner rolls. Most people don’t have the time or energy to prepare and cook a dozen individual slider patties. However, if you wish to make a restaurant-style slider, I recommend using my classic burger patty recipe and just making a smaller size. Otherwise, you can make mini fast food burgers patties as well. Like any good burger, the bun you use can make or break the final dish. For sliders, just like burgers, the bun should not be overly dense, crusty, or chewy. This will distract from the texture and flavor of the meat and toppings. The best sliders buns are potato rolls in my humble opinion. The kind that come attatched together in the package, to be specific. 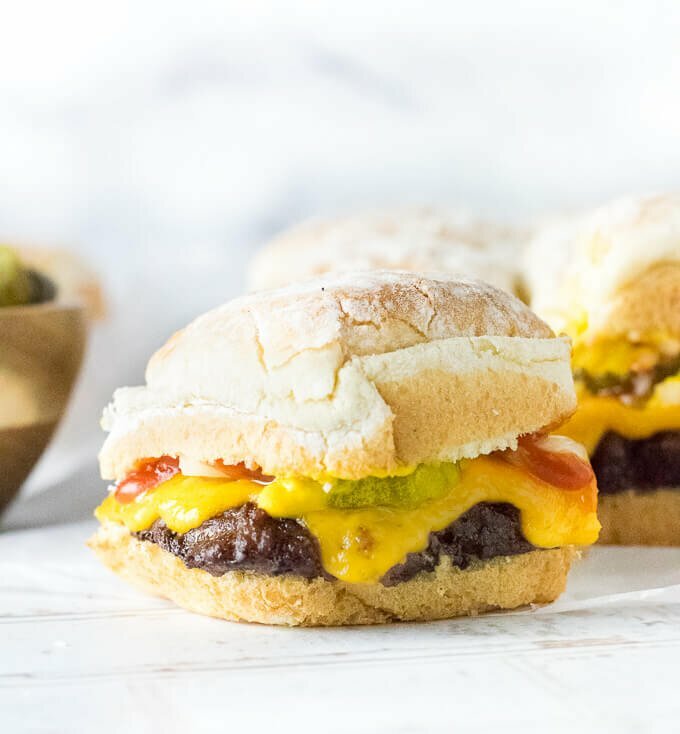 True, potato rolls are not the only good option, but they are moist and soft, making them perfect for letting the slider ingredients shine through each bite! 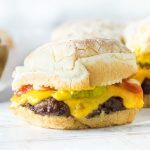 My recipe provides instructions for creating cheeseburger sliders with pickles, onions, ketchup, and mustard. However, there is no reason why you cannot customize this recipe to fit your tastes. Make bacon cheeseburgers instead if you wish, or add Big Mac Sauce to replicate your favorite fast food flavor. 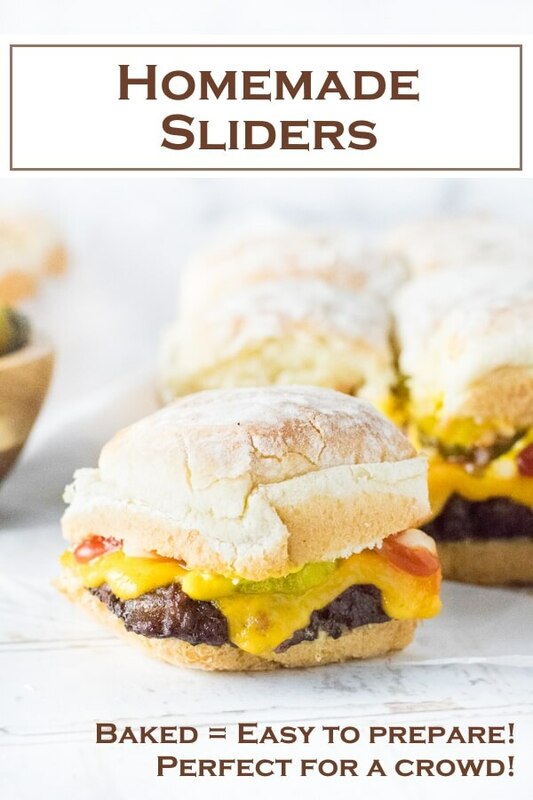 I recommend using a large rimmed baking sheet for preparing these homemade sliders. The rim is essential to prevent grease from running off during cooking, and the large size allows you enough to flatten the beef patty. 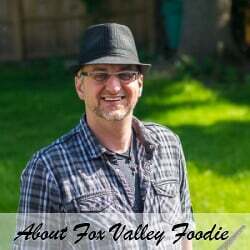 In particular, I use a baking sheet with an interior measuring 15 1/2″ x 10 1/2″. Press the beef patty flat, so it is approximately 1/2″ thick and measures 15″ x 10″. It is important to use ground chuck or 80/20 beef. If your beef has too much fat in it, it will shrink too much while cooking. If it does not have enough fat, it will not shrink enough and be too large… not to mention dry. If for any reason your beef patty does not fit your dinner rolls, you can obviously add more dinner rolls as needed, or trim down the patty to fit. Sprinkle salt and pepper on the top of the beef and place it in the oven for 20 minutes, or until the interior reaches 160 degrees. While beef is baking cut the dinner rolls in half to separate the top from the bottoms. When beef patty is finished baking, remove it from the oven, discard the grease, and place the patty on the bottom half of the buns. Top the patty with enough cheese to cover and place the baking sheet back in the oven for 2 minutes, or until the cheese is melted. 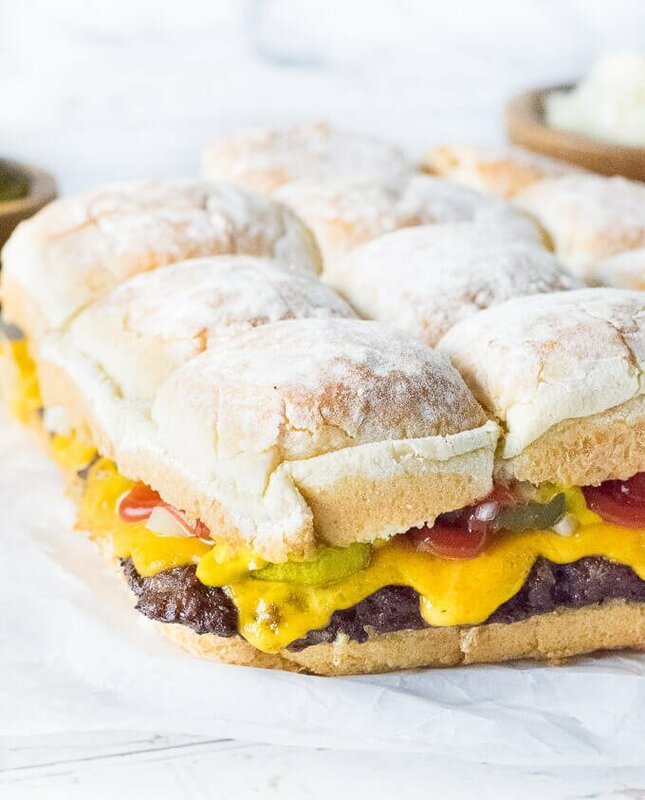 Once the cheese has melted, remove from the oven and sprinkle generously with diced onion, top with pickles, ketchup, mustard, and cover with the top half of the buns. Place back in the oven for another 1-2 minutes, to allow top buns to warm. Remove from the oven, cut into individual sliders, and serve. Tip: Lining the baking pan with aluminum foil makes cleanup easier. *Using a round glass or bottle works well as a mini rolling pin for flattening the beef. 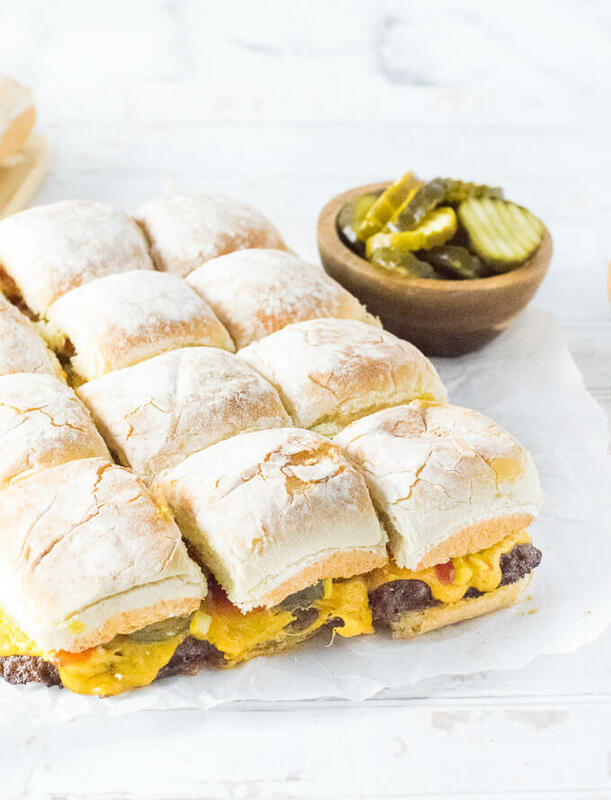 IF YOU LIKED THIS RECIPE you will love my Baked Mississippi Roast Party Sandwiches too!